This is not a new resource but just a reminder that we have oodles of fantastic ideas to help you create effective maths lessons in your classroom. Calendars are hardly ever mentioned in the curriculum but knowing how to read them is an essential everyday skill. Every month, every class in your school can complete a blank calendar – one for themselves and one for class discussions. What month is it? What season is this? What day of the week does the month begin? 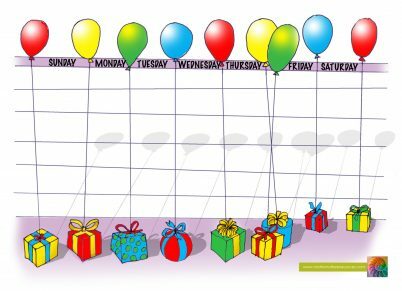 Just write the letters of the month in the balloons, then start writing in the numbers for the days of the week. For more ideas like this see our Time activities, Time graphics or Time photographs.